My research involves X-ray crystallographic studies of macromolecular assemblies and enzymes involved in DNA metabolism, such as helicase/primase, dihydrofolate reductase (DHFR) and DNA polymerase beta (polB). Past projects include construction of a crystallographic movie of DHFR, depicting loop and subdomain conformational movements during one turnover of substrate. 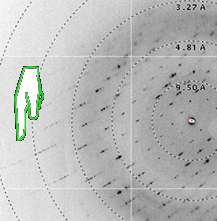 I have also written a web server for treating anisotropy in X-ray crystallographic data sets. I work at the UCLA-DOE Molecular Biology Institute. Calculate and display the self rotation function for your data set. 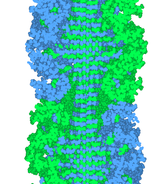 Access coordinates and interactive Chime illustrations of cross-beta fibrils. Access coordinates and interactive Chime illustrations of amyloid fibril models. Movie based on 30 crystal structures of E.coli DHFR. Automatically generate a table of data and refinement statistics from scalepack and Refmac5 output. Calculate molecular weight from amino acid sequence. Obtain matrices to convert between different lattices. Estimate the number of molecules in the asymmetric unit. A double S shape provides the structural basis for the extraordinary binding specificity of Dscam isoforms. Sawaya MR, Wojtowicz WM, Andre I, Qian B, Wu W, Baker D, Eisenberg D, Zipursky SL. Cell. 2008 Sep 19;134(6):1007-18. 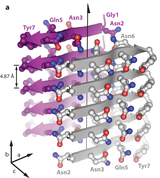 Atomic structures of amyloid cross-beta spines reveal varied steric zippers. Sawaya MR, Sambashivan S, Nelson R, Ivanova MI, Sievers SA, Apostol MI, Thompson MJ, Balbirnie M, Wiltzius JJ, McFarlane HT, Madsen AØ, Riekel C, Eisenberg D. Nature. 2007 May 24;447(7143):453-7. Characterizing a crystal from an initial native dataset. Sawaya MR. Methods Mol Biol. 2007;364:95-120. Crystal structure of the helicase domain from the replicative helicase-primase of bacteriophage T7 Sawaya MR, Guo S, Tabor S, Richardson CC, Ellenberger T. Cell. 1999 Oct 15;99(2):167-77. Crystal structure of T7 gene 4 ring helicase indicates a mechanism for sequential hydrolysis of nucleotides. Singleton MR, Sawaya MR, Ellenberger T, Wigley DB Cell 2000 Jun 9;101(6):589-600. An open and closed case for all polymerases. Doublie S, Sawaya MR, Ellenberger T. Structure Fold Des. 1999 Feb 15;7(2):R31-5. Review. Crystal structures of human DNA polymerase beta complexed with gapped and nicked DNA: evidence for an induced fit mechanism. Sawaya MR, Prasad R, Wilson SH, Kraut J, Pelletier H. Biochemistry. 1997 Sep 16;36(37):11205-15. Crystal Structure of Rat DNA Polymerase Beta: Evidence for a Common Polymerase Mechanism M. R. Sawaya, H. Pelletier, A. Kumar, S. H. Wilson, & J. Kraut (1994) Science Vol. 264, 1930-1935. Structures of Ternary Complexes of Rat DNA Polymerase Beta, a DNA Template-Primer, and ddCTP H. Pelletier, M. R. Sawaya, A. Kumar, S. H. Wilson, & J. Kraut (1994) Science Vol. 264, 1891-1903. Enzyme-DNA Interactions Required for Efficient Nucleotide Incorporation and Discrimination in Human DNA Polymerase W. A. Beard, W. P. Osheroff, R. Prasad, M. R. Sawaya, M. Jaju, T. G. Wood, J. Kraut, T. A. Kunkel, S. H. Wilson (1996) Journal of Biological Chemistry Volume 271, Number 21, pp. 12141-12144. Crystal Structures of Human DNA Polymerase Complexed with DNA: Implications for Catalytic Mechanism, Processivity, and Fidelity Huguette Pelletier, Michael R. Sawaya, William Wolfle, Samuel H. Wilson, and Joseph Kraut (1996a) Biochemistry, Volume 35, Issue 39, pp. 12742- 12761. A Structural Basis for Metal Ion Mutagenicity and Nucleotide Selectivity in Human DNA Polymerase Huguette Pelletier, Michael R. Sawaya, William Wolfle, Samuel H. Wilson, and Joseph Kraut (1996b) Biochemistry, Volume 35, Issue 39, p 12762-1277. Characterization of the Metal Ion Binding Helix-Hairpin-Helix Motifs in Human DNA Polymerase by X-ray Structural Analysis Huguette Pelletier and Michael R. Sawaya (1996c) Biochemistry, Volume 35, Issue 39, p 12778-12787. Loop and Domain Movements in the Mechanism of E. Coli Dihydrofolate Reductase: Crystallographic Evidence. M. R. Sawaya, & J. Kraut. Biochemistry, Vol 36, pp. 586-603, (1997). DHFR the Movie. Meanwhile, here is a musical score to enhance your viewing enjoyment. If you have any comments about my movie, please click on my email Michael R. Sawaya (sawaya@mbi.ucla.edu). A screen should pop up and there will be buttons for send and cancel. 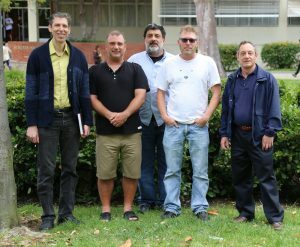 Back to Kraut Research Group homepage and see other Kraut Group Members.